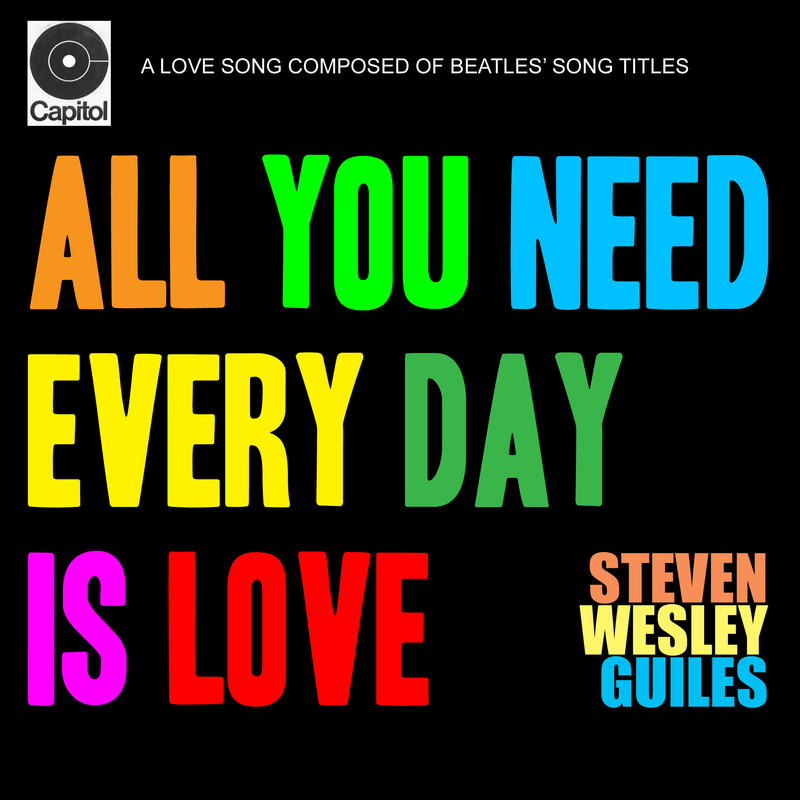 It is composed ALMOST entirely of Beatles' song titles. (I'm looking at YOU @mattblick). And I didn't intentionally choose deep cuts, I just went with lines that would work within the idea of a love song (which, The Beatles had a nice supply of great song titles for such a feat. I'm no Beatles' expert (@mattblick is!). Joy is not a diamonds girl. But there is something I give her every Valentine’s Day since the start of our dating relationship: a song. I have written her a new song each Valentine’s Day for the last 24 years. February also happens to be the month when I write 14 songs in 28 days. (I’ve only been doing THAT since 2008. We’ve been married since August of 1995. Eventually I’m going to dig around old cassettes and cds and hard drives and compile all of the songs. Some of them are awfully embarrassing. Some were recorded on a 4 track cassette. Others on the Roland VS-880. Then the Roland VS-1680. And finally multiple incarnations of ProTools (starting with 7 up to the 12 I am on currently). But none of those things mattered as long as I had a song for her on the day of Valentine’s. These songs are for the girl that said yes. Congrats on the 24th consecutive year of the marriage and the dedicated love song every Valentine's day. I hope she appreciated it. It actually sounds a bit christmasy in the instrumentation and accompaniment, and the lyrics are cute. Nicely done. Super cool idea using only song titles as the lyrics for a song. Nice gentle touch on this, really gels well with the simple bass and the dreamy guitarpreggios, soft high vocal. Great story about you and your wife too for context. I like how the bass really holds it all together, it really works without the drums in there (well other than the bell). Fun collage valentine: nicely made, and just the right amount of sweetness. I will spread my beatle wings and fly. Beautiful song. I am in awe of your voice and melody line. Oh, awesome idea! Love your background on why you do this, congrats! So much nostalgia for me having listened to so much Beatles when I was younger. 😀 Great execution! First reaction is what a great melody this is. Way to go, brother. This is super clever with the use of the titles, and it's super cute too! This is super clever! And well done. I don't think I would have noticed if you hadn't mentioned it. Love the chorus. Beautiful. Love the guitar playing. I shared the Youtube video with a few people. Great work! Dude this is excellent. I'm a huge Beatles fan so something so earnest and good like this makes me happy. Your chorus is great and gives a lift, especially the bass line. Love how you got the chime on the guitars. Fun idea, but your execution turns it into something genuinely great. Lovely melody and killer vocal performance, the guitars sound gorgeous too. Really love the shift into a higher register for the chorus and the drive my car line really made me grin. If you played this to somebody who had (somehow) never heard the Beatles, they might think you were a little crazy. wow!!!! i've done this technique (for one of the first songs I wrote, when Frank Sinatra died, I used alot of sinatra song titles..) but this is up on another level- really fantastic song, arrangement and performance (yeah, those singing voice(s) of yours, wow! so in conclusion .... - maybe i'm amazed, i'm a jealous guy, oh my my, i'd have you anytime! yeah yeah yeah! Excellently done! Love the understated instrumentation which allows your whole vocal register to really SHINE. Wonderful song, Steven.